I was in the SAFA (a Ham radio mess) and I saw there a cheap antenna analyzer. The OM DG8SCD sell there the circuit board, the PIC Chip and a building instruction. The parts I get by Reichelt. 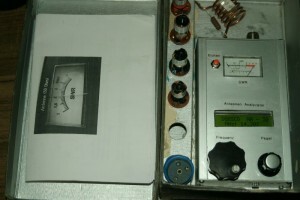 This is the finish complete set with Test coils for usage as a Dipmeter. It works great from NF frequencies up to near 50 MHz. He have no copyright in the manual. so I think I can share this manual here. But the PIC with the software on it, you must order by DG8SCD.